With no less than four best musical awards in London and seven Tony Award nominations on Broadway. This is a desperately moving piece of work created by William Russell, directed Bob by Tomson and Bill Kenwright, a real human story about, class, friendship love secrets, and heartbreak. 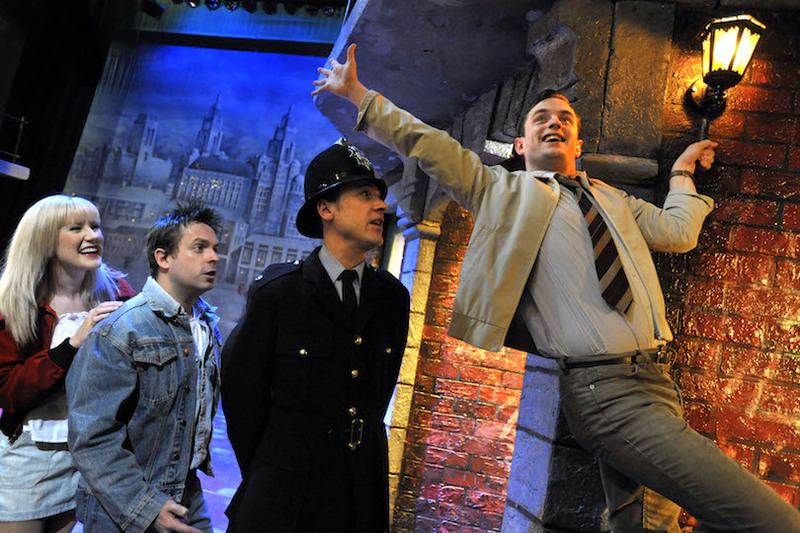 Lyn Paul reprises the iconic role of Mrs Johnstone, one she first played in 1997, as does Sean Jones who was chosen to play Mickey in the final cast of the twenty four year run of Blood Brothers at its venue of twenty one years at the Phoenix Theatre in London. Set in post war 1960’s which in some ways marked the start of the decline in Liverpool’s fortunes; the economies similar to other countries industries were starting to collapse. Mrs Johnstone (Lyn Paul) a young woman who already had seven children is deserted by her husband, her destiny now full of up and downs when she realises she is again pregnant with twins. In clandestine contract made out of desperation she gives one of the twin boys Eddie (Mark Hutchinson) over to her prosperous boss Mrs Lyons (Sarah Jane Buckley) who is unable to have children. She is left heartbroken with her remaining twin Mickey (Sean Jones). Threatened by a realisation of a growing friendship of the boys Mrs Lyons is forced to move away. Hot on her heels serendipity continued as huge parts of the old Victorian city were bulldozed, Liverpool Council moved thousands of families out of the city to live in countryside. Dean Chisnall (Narrator) the dark presence stupendously tells this tragic story that tackled social class themes that resonate today which sees the boy’s oscillate in and out of each other’s lives. Integral to this heart renching story is their childhood friendship with Linda (Danielle Corlass) who merges between the young men in a tug of war lover of them both. An exceptional performance from a gifted cast, beautiful vocals by Lyn Paul great performances by both Mark Hutchinson and Danielle Corlass and a virtuoso accomplishment by Sean Jones who moved many to tears and brought the whole auditorium to its feet at the end. This was my fifth time in fifteen years last night and without doubt the best, I would highly recommend folk to go see it!